Forino family has dedicated his life to the art of craftsmanship of leather gloves. Three generations of craftsmen who carry on a tradition started in Naples in 1899 and, after Venice, has arrived in the small store of Capri.Tradition, research of new trends, quality and creativity are the foundations of Capri Gloves. 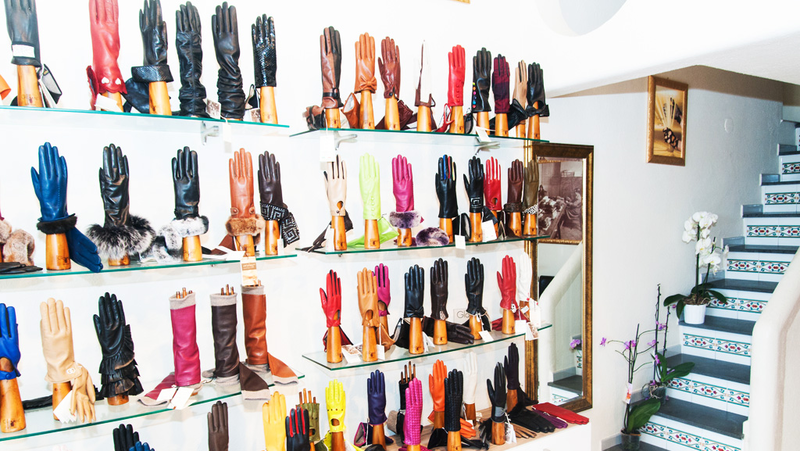 His leather gloves are small works of art that over time have become a successful example of Italian fashion.The choice of only exclusive leathers combined with rigorous craftsmanship are the trademark of Capri Gloves that now you can find in the small caprese shop a few meters from the “Piazzetta”. Thanks to the highest quality materials, these gloves are the perfect accessory for those who love colors and elegance guarantying a perfect functionality given by the precious lining, the fine fabrics and a fit extremely versatile. Thanks to the highest quality materials, these gloves are the perfect accessory for those who love colors and elegance guarantying a perfect functionality given by the precious lining, the fine fabrics and a fit extremely versatile. Made in italy product. Small everyday luxury! Grazie ai materiali di altissima qualità questi guanti sono il tocco perfetto per chi ama i colori e l'eleganza senza dover rinunciare alla funzionalità data dai tessuti, dalle pregiate fodere interne e dalla vestibilità estremamente versatile. Prodotto esclusivamente italiano. Piccolo lusso quotidiano!